It’s a fact of life: we’re all getting older! And it’s not just us as individuals; society at large is at it too. Just take the United States as an example. In 1970 the median (average) age of the US population was 28 years. Today it’s 38. In much of Europe and Japan the median age has now passed 40. While it’s great that more of us are enjoying longer lives, inevitably questions are raised about the quality of life we’re experiencing later on in life. So how can we keep doing more of the things we love, including gardening, as we gracefully move into our 80s, 90s and beyond? And, more generally, how can we create beautiful spaces for anyone, of any age, who may have limited mobility? Nature and gardening are deeply calming and health boosting, so planning or adapting a garden so it’s easy access is a must if we are to continue it as life changes. Whether you are a wheelchair user or rely on a walking aid, how you get around a garden will need much more consideration when compared to able-bodied gardeners. Paths should be wide enough to allow unhindered passage – about 1.2m (4ft) for a wheelchair – with trees and shrubs pruned back to stop them slapping you in the face as you move through. Wheelchairs require proper turning circles where paths end – an absolute must if the user isn’t to become unbalanced and deposited into the shrubbery! Consider path surfaces. Gravel paths are hard going for anything but motor-assisted wheelchairs. Hard-packed self-binding gravel paths are better. Smooth paving set into a well-consolidated base is best and will give an all-weather surface that won’t become claggy, soft or uneven during spells of wet weather. Of course, all trip hazards will need to be removed – step changes in level, ill-placed rocks, and bulging tree roots can all prove awkward or even dangerous to the less mobile. It is likely that garden steps will need replacing with ramps. Most wheelchair ramp manufacturers recommend a maximum gradient of 1:12 for independent use – that’s a climb of one metre/foot for every 12 metres/feet travelled. Yet even this may be too steep for those with limited upper body strength. For comfort a gradient of 1:15 is recommended, with 1:20 seen as ideal. Greenhouses are a great place to potter, particularly on cool, wet days when they take on the feel of a cosy, protected bolthole. Many off-the-shelf greenhouses have a trip-hazard threshold as standard, but threshold-free greenhouses are available, with sliding doors opening to allow unhindered, hazard-free entry. Raised beds do a great job at raising the soil surface a little way above the surrounding ground level. This certainly saves the back, but for truly accessible gardens you’ll need to be a little more ambitious. Nowadays there is a plethora of raised troughs, planters and growing boxes that will bring the planted area right up to wheelchair or waist level. It goes without saying that being able to plant, tend and harvest your produce without a struggle will greatly enhance the gardening experience. Vertical gardening – where plants are grown against walls and fences – is another idea. Nail an old pallet to a wall then stuff it with potted herbs to spill out between the slats. Make the most of window boxes, not just on windowsills but supported by brackets screwed firmly to the fence or onto upright posts. Or enjoy manger-style planters, stacked high to give a visual wall of produce that’s both beautiful and easy to tend. Very-raised-beds can be as long as you like, but consider how far in you’ll be able to reach and plan the width of the beds accordingly. Sturdy handles, screwed into the tops of beds at regular intervals, will give something to hold on to, improving confidence and steadiness. 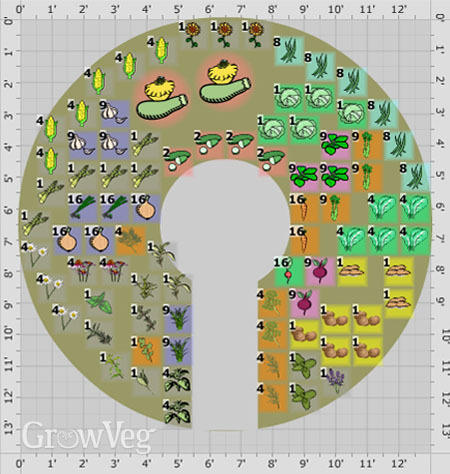 Keyhole gardens – circular beds with a central access point (see garden plan below) – are another clever innovation that translates well to the easy access garden. It isn’t just planters and beds that can be raised up. Many garden suppliers now sell raised ponds that can be slotted together like Lego then lined, ready to fill. In fact, a number of specialist ‘raised-everything’ companies have sprouted up over the past few years, stocking a range of made-to-measure and bespoke raised beds, retaining walls, ponds, seats and more, often made from sustainably-sourced wood with a multi-decade lifespan. Easy access gardens shouldn’t be complex and fiddly. Clumsy corners, nagging nooks and awkward crannies must be designed out in favour of smooth, easy-to-reach spaces. Little patches of lawn that are liable to become a headache can be replaced with small areas of paving, or perhaps aim for a wildflower meadow that will only need cutting once or twice a year. The Garden Planner is a great tool to play around with because it enables you to try out so many ideas. With lots of customisable shapes, raised beds, wall-mounted planters and other features, its infinite possibilities mean gardeners can chop, change and tweak to their hearts’ content until the most user-friendly, easy access layout is perfected. If your mobility is in any way limited but you’re determined to carry on gardening, we’d love to know how you make things in the garden that little bit easier. Please share your experiences in the comments section below. "i AM 74 and will have a knee replacement next year. I live on the east side of Vancouver Island in Campbell River. When I "made" my raised beds, I used the raised beds already in my back yard. There are no passages between beds. The beds are on a steep-ish hill; the hill runs the length of the garden. How to plan with the hill is my first challenge. 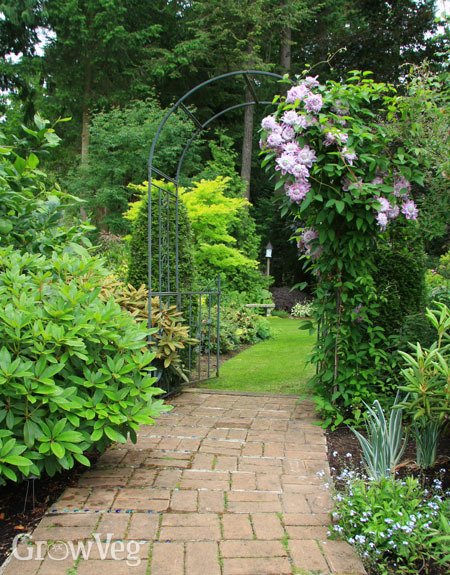 My second is how do I plan an entrance: If I start by making an entrance at the "bottom" (physically) of the garden, I will loose about 1/3rd of the beds. This same situation is identical if I choose the another, perpendicular, position, I would have to make several entrances at distances that allow me to reach to the other sides of beds. All this is predicated on retaining the external fencing around the garden. If maintaining the existing plot decreases my square footage, I would have to take over my tree and flower gardens which are coming into maturity and look very lovely this year. If I am restricted to my existing veg garden area, would I gain more growing space by leveling the entire plot and use the differing height of the beds to build in structures so I can grow upwards, as with runner beans, slings for squaches, and maybe trellis with pockets for strawberries. I appreciate what you can tell me about making my veg garden more mobility friendly. PS: I am legally blind, and I use my limited vision intensely. Perhaps that is a metaphor for transforming my garden. Connie Burns"